BURNABY, BC, (October 2, 2014) – Since 1992, Destination Toyota has been an integral part of the community, meeting the mobility needs of Burnaby and surrounding area drivers. 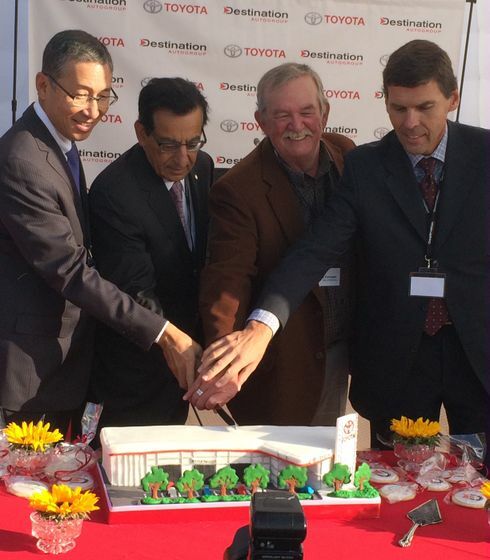 Now Destination Toyota is poised to take its success to even greater heights, with construction beginning Thursday on a new, three-level, 90,000-square-foot facility to be located at 4451 Still Creek Drive. The new dealership, which will include at least 20 additional associates to its already 67 member team, will have special features such as a striking new showroom, a large service shop with 28 bays, an on-site body shop, an automatic car wash, a tire centre, and many other amenities to appeal to customers. To commemorate this important occasion, Destination Toyota will be holding the initial concrete pouring at the site on Thursday (October 2), with many special guests in attendance, including Burnaby Mayor Derek Corrigan, Members of the Legislative Assembly of British Columbia Richard Lee and Kathy Corrigan, Toyota Canada Inc. (TCI) President and CEO Seiji Ichii, and Larry Hutchinson, Vice President of Sales at TCI.